At the Open Compute Summit in Santa Clara, California, Cavium announced that its ThunderX2 ARMv8-A Data Center processor is being tested by Microsoft for running a variety of workloads on the Microsoft Azure cloud platform. The ThunderX2 product family is Cavium's second generation 64-bit ARMv8-A server processor SoCs for Data Center, Cloud and High Performance Computing applications. The family integrates fully out-of-order high performance custom cores supporting single and dual socket configurations. ThunderX2 is optimized to drive high computational performance delivering outstanding memory bandwidth and memory capacity. Cavium said its hardware platform is fully compliant with Microsoft's Project Olympus which is one of the most modular and flexible cloud hardware designs in the data center industry. The platform integrates two ThunderX2 processors in a dual socket configuration. ThunderX2 SoC integrates a large number of fully out-of-order custom ARMv8-A cores with rich IO connectivity for accommodating a variety of peripherals for Azure, delivering excellent throughput and latency for cloud applications. The platform has been designed in collaboration with a leading server ODM supplier for Microsoft. 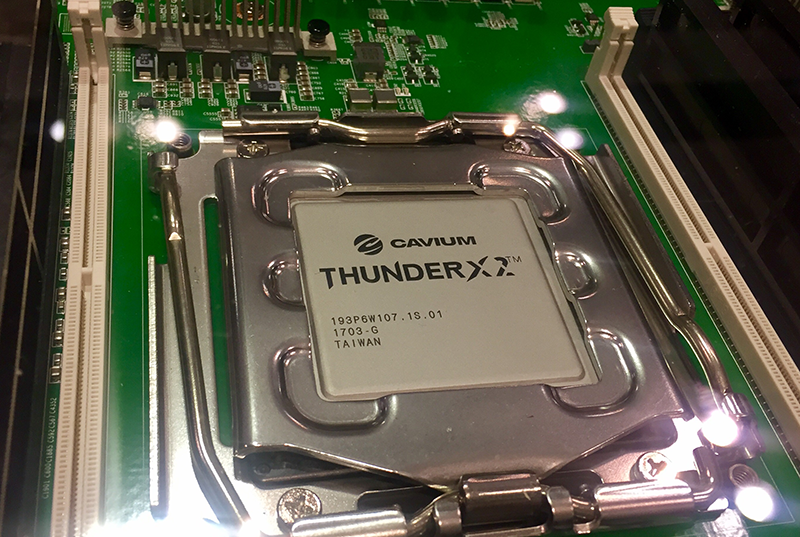 "Cavium is excited to work with Microsoft on ThunderX2," said Gopal Hegde, VP/GM, Data Center Processor Group at Cavium. "ARM-based servers have come a long way with first generation ThunderX-based server platforms being deployed at multiple data centers, which enabled a critical mass of ecosystem partners for ARM. We see the second generation products helping to drive a tipping point for ARM server deployment across a mainstream set of volume applications. Microsoft's support will help accelerate commercial deployment of ARMv8 server platforms for Data Centers and Cloud."